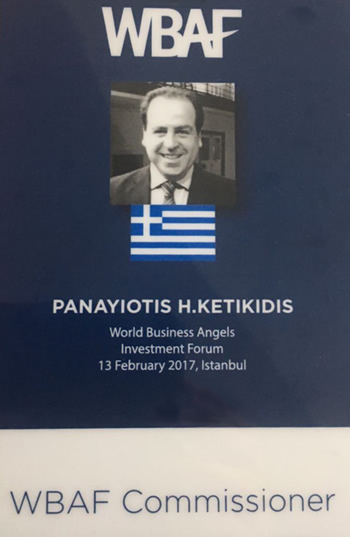 During the World Business Angels Investment Forum (WBAF) 2017 that took place 13-14 February in Istanbul, Turkey, Prof. Panayiotis Ketikidis, co-founder of HeBAN, was appointed as WBAF Commissioner for Greece. The WBAF honors individuals who have evidently showed their commitment to furthering early-stage investment markets by offering to key individuals the role of WBAF Commissioner. Becoming a WBAF Commissioner includes embracing certain duties that are designed to serve WBAF members and the global community. Combining regular contributions from many self-motivated WBAF Commissioners around the world means that all forum members benefit from shared knowledge, better networking and increased exposure. The World Business Angels Investment Forum (WBAF) 2017 brought key players of all markets together to discuss the benefits and challenges for the angel investment community in achieving successful growth for their businesses. More than 90% of the early-stage investments in Europe come from angel investor capital.